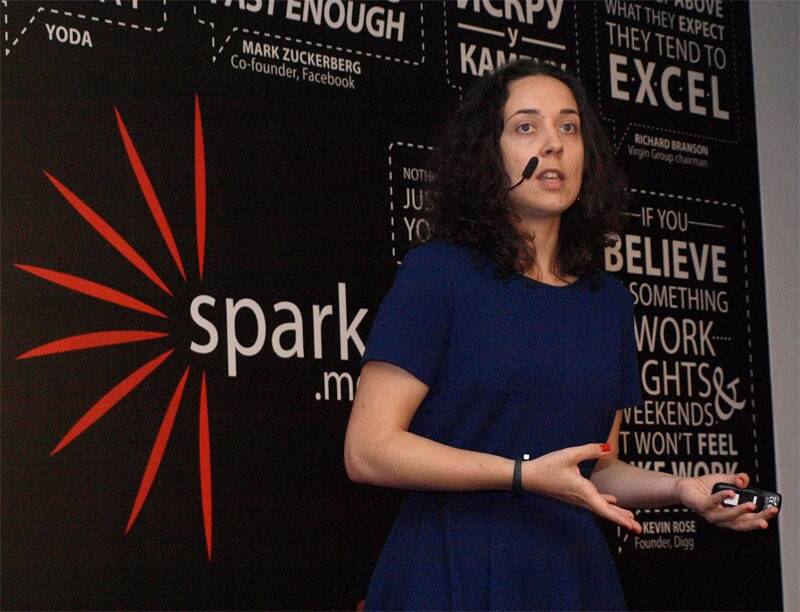 On Spark.me, Elina Zheleva took the stage to talk about design thinking- don’t be fooled, design thinking does not actually translate to thinking about design. As a design thinking evangelist, she is trying to encourage companies of all shape and sizes, especially startups, to think like designers when developing their products and services, putting the end user in the center of the process. If you are still aching for a definition, design thinking is basically a methodology used to find creative and innovative solutions in business. So what does that actually have to do with designers? Well, designers tend to always look for new solutions, says Elina, as opposed to engineers who prefer a road more traveled, and already tried and tested. Although the „innovative“ in the definition might evoke thoughts of high-tech solutions, design thinking is really going back to the basics- talking to people, for starters, a practice that should never be overlooked in business planning. If you are developing something for a client or a customer, first you have to walk a mile in their shoes and look through their eyes. It’s going back to Margarte Mead and ethnography, learning from observing- and then unlike Margaret Mead, making what you learned into a business. How does that relate to startups, you might ask. Turns out, quite a lot, especially when talking about CEE startups, who have a tendency to develop solutions for the sake of development– a techy sort of larpurlartism. They make a mistake in their very first steps and do not set out to solve a problem. Before they get knee deep in the development, they don’t ask themselves what problem their solution or product is solving, is there even a problem to solve, but more importantly- is there even a need or want for their product. They have no idea whose life they are making better, simpler or more exciting, says Elina. This is called a build first approach, and it has its drawbacks. Once you’ve build something, you’ve already put in time and effort, become attached to it and you basically grow deaf to any feedback that does not perfectly align with your own vision of it. This leads to either generic or crowded solutions, the ones who do not hold that much appeal for the end user- failed products, to be perfectly blunt. What you might want to adopt is the empathy-first approach – and don’t worry, it is not as touchy feely as it sounds. This just means to get your head out of the development cloud for a while and actually approach your users and do a little research before you plunge into developing something that will end up having little or no users whatsoever. Empathy is basically this great ability we have to put ourselves in other people’s shoes and see things from their perspective- to understand their wishes, needs and prejudice as if they were our own. Empathy gives you focus, and saves you from leaning to much toward the too generic or too crowded. It allows you to truly model your product after your target audience, Elina explains, and it saves you a lot of pain in the process, making sure you don’t exhaust yourself, your startup and your resources going in the wrong direction. That’s empathy-first. So listen to both Einstein and Elina- find a problem, think about whether you can solve it and if you care about solving it, and if the answer is yes- then get cracking.